Your company is hiring. You’ve determined the position’s requirements, written a job ad, and published it on a job board. It’s out there for throngs of job seekers champing at the bit to apply to your opportunity, so all you have to do now is sit back and wait. And wait. And wait. It’s been weeks, and instead of waves of applicants, you only get a handful (or worse, zero). What gives? Where have all the candidates gone? You may not be receiving tons of applications simply because there aren’t as many candidates looking for jobs as there used to be. As per BLS data, things have changed dramatically in the past 10 years. 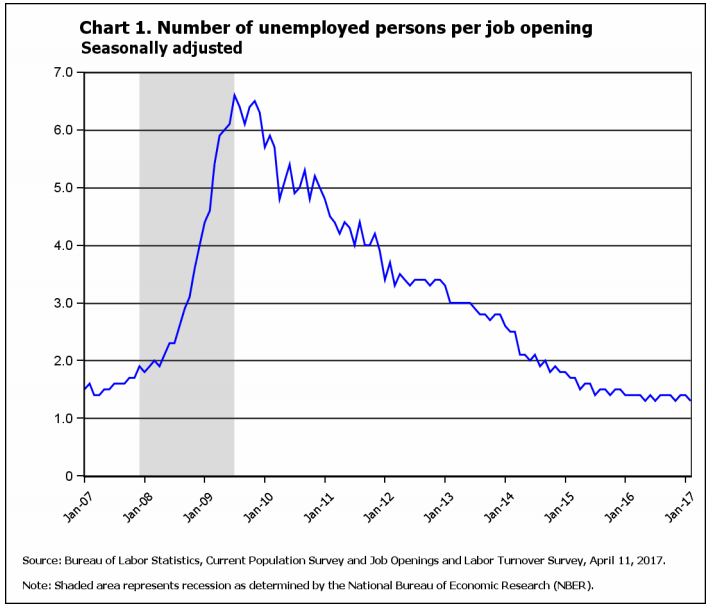 In December 2007 there were 1.9 unemployed persons per job opening, and this figure spiked to 6.6 in July 2009. Since that peak, the ratio has trended downward, and as of February 2017, there were 1.3 unemployed persons per job opening. Seasonality and business cycles play a role in employment numbers, of course, but it’s clear that when there are less unemployed people looking for jobs, employers will have to try even harder to win the “war for talent” and tap into a variety of talent pools beyond those actively seeking a new job. So how do you attract qualified candidates with your job ad, especially if your perfect hire is likely a passive job seeker and/or already employed? Review your job ad to be sure the title, location, HR contact information, and URLs are all correct. Something seemingly miniscule like a typo could be keeping you from getting responses. Starting a new job—especially if it requires leaving a current one—is a big life decision. Does your job ad “sell” your company and the open position well enough to convince top talent to apply? Brevity is essential (aim for 500 to 1,000 words), but make sure you’re being persuasive and not just descriptive. Why is your company a great place to work? What makes your culture unique? What will the person in this role be doing, who will they be working with, what will they be able to accomplish, and how will they be recognized? In short, why is this position their dream job? Speak the same language job seekers do and include relevant keywords. This will help search engines AND qualified candidates find your posting. When you post a job on iHire, our Job Optimizer (JO) tool will give your job ad a rating from “Very Weak” to “Great” and suggest the right keywords to include based on the specific industry and job title. Share your job ad with your network to tap into an excellent source of hires: referrals. Your current employees may know someone who would be perfect for the job, but that person isn’t actively looking and would never find your job ad otherwise. Spread the word with our email template or check out a mobile solution like Engauge, iHire’s employee referral and communication app. Keep your application process as straightforward as possible. If you ask candidates to jump through hoops and provide everything but the kitchen sink before they even have a chance to speak with you, chances are your abandonment rates – especially with passive job seekers – will be high. Check out our job ad template for application instruction ideas as well as examples for other posting sections. Don’t make potential hires wait or they’ll move on to their many other prospects. Providing a positive candidate experience is so important when qualified candidates are hard to come by. Once you do get responses, be considerate to all applicants and keep them in the loop. Build and maintain a solid employer reputation and increase your chances of winning the war for talent by simply following the golden rule. If you aren’t getting responses to your job ad, take a step back and follow these hiring tips to ensure you’re putting your best foot forward, making the most of your job ad’s content, and providing the right candidate experience to attract top talent.